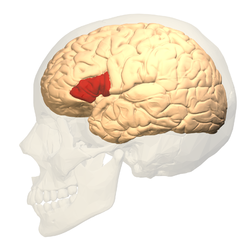 Broca's area is a region in the brain of humans and other hominids. It is in the frontal lobe of the dominant hemisphere, usually the left. It works as part of "speech production". 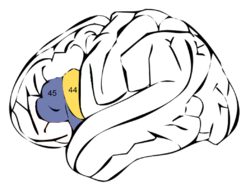 Language processing has been linked to Broca's area after Pierre Paul Broca. Broca did autopsies on patients who had difficuty speaking when they were alive. He found damage to a particular area of the brain. They had lost the ability to speak after injury to the posterior inferior frontal gyrus of the brain. Since then, the region he identified has become known as Broca's area. The deficit in language production is Broca's aphasia, also called 'expressive aphasia'. Functional magnetic resonance imaging (fMRI) studies have identified activation patterns in Broca's area associated with various language tasks. However, slow destruction of the Broca's area by brain tumors can leave speech relatively intact. This suggests that, given time, its functions can shift to nearby areas in the brain. ↑ Cantalupo, Claudio & Hopkins, William D. 2001. "Asymmetric Broca's area in great apes". Nature 414 (6863): 505. doi:10.1038/35107134. PMC 2043144. PMID 11734839. ↑ Boeree C.G. (2004). "Speech and the brain". ↑ 4.0 4.1 Dronkers N.F. et al 2007. "Paul Broca's historic cases: high resolution MR imaging of the brains of Leborgne and Lelong". Brain 130 (Pt 5): 1432–1441. doi:10.1093/brain/awm042. PMID 17405763. ↑ Plaza M. et al 2009. "Speaking without Broca's area after tumor resection". Neurocase 15 (4): 294–310. doi:10.1080/13554790902729473. PMID 19274574. This page was last changed on 28 June 2018, at 12:12.